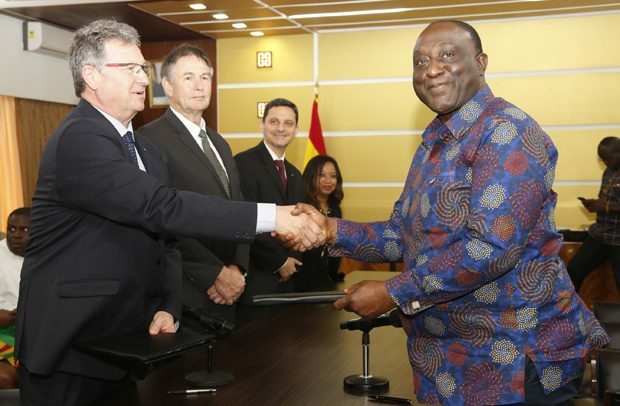 Ghana has signed a Memorandum of Understanding (MoU) with Nissan Group of Africa for the establishment of an automotive manufacturing industry in Ghana to sell and market Nissan products in West Africa. Managing Director of Nissan Group of Africa, Mike Whitfield, announced this on Tuesday when he paid a courtesy call on President Akufo-Addo. According to Mr. Whitfield, Nissan intends to be the first car maker to assemble vehicles in Ghana to build on its market leadership in the country. “Nissan is the most popular auto brand in Ghana because the quality of our products and services has won the trust of our customers,” Mr. Whitfield said. The President explained that his administration had embarked on a journey of moving the country away from being mere producers and exporters of raw materials with a focus on value-addition and industrial activities. One of the areas of focus, he stressed, was the automotive industry, adding that his administration had used the last 22 months to strengthen the fundamentals of the Ghanaian economy to attract such investment. “To have an A+ company like yours in Ghana is positive, and we welcome you strongly. We hope that the MoU that will be signed will not just remain an MoU but will translate into concrete benefits for us all,” President Akufo-Addo said. The MoU seeks to unlock economic potential, promote development of the automotive sector and promote investor-friendly regulatory frameworks that encourage sustainable car manufacturing. The aim is to promote infrastructure development, job creation and skills development in Ghana. Industry wide, vehicle sales in Ghana has been growing steadily at an annual rate of about 10%, and now stand at about 9,150 vehicles a year. The agreement builds on Nissan’s investment in Nigeria where in 2013 the company became the first major automaker to assemble cars. Nissan is a global full-line vehicle manufacturer that sells more than 60 models under the Nissan, INFINITI and Datsun brands. In fiscal year 2017, the company sold 5.77 million vehicles globally, generating revenue of 11.9 trillion yen.